My name is Elizabeth Anne Hawksmith, and my age is three hundred and eighty-four years. If you will listen, I will tell you a tale of witches. A tale of magic and love and loss. A story of how simple ignorance breeds fear, and how deadly that fear can be. Let me tell you what it means to be a witch. In the spring of 1628, the Witchfinder of Wessex finds himself a true Witch. As Bess Hawksmith watches her mother swing from the Hanging Tree she knows that only one man can save her from the same fate: the Warlock Gideon Masters. Secluded at his cottage, Gideon instructs Bess, awakening formidable powers she didn’t know she had. She couldn’t have foreseen that even now, centuries later, he would be hunting her across time, determined to claim payment for saving her life. In present-day England, Elizabeth has built a quiet life. She has spent the centuries in solitude, moving from place to place, surviving plagues, wars, and the heartbreak that comes with immortality. Her loneliness comes to an abrupt end when she is befriended by a teenage girl called Tegan. Against her better judgment, Elizabeth opens her heart to Tegan and begins teaching her the ways of the Hedge Witch. But will she be able to stand against Gideon—who will stop at nothing to reclaim her soul—in order to protect the girl who has become the daughter she never had? This book was equal parts fun and frustrating. I downloaded it to my Kindle in the hopes that it would be an entertaining historical fiction with a slight mystical element to it – and part of it was. But the novel as a whole felt like it was written by two different authors. The book spans 370 years, from the seventeenth century through modern(ish) day, stopping in the 1880s and WWI. These historical pieces were well written and fully fleshed out. They had mystery and intrigue, along with a well-defined tone and setting. The novel is weakest when it comes to present day Elizabeth. 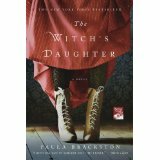 The tone shifts from historical thriller to a muddled New Age “Practical Magic” feel, and it’s quite jarring. I felt myself rushing through the modern segments to get back to the meatier period pieces. But the tonal shifts weren’t my biggest concern with the book. What irked me the most was the pacing of the action. Each time period ended with a sort of magical battle that was heart-breakingly anti-climatic. I’m with Bess for 50-100 pages, feeling her pain and loneliness, hating the Warlock Gideon Masters right along with her, and the climax would resolve the situation in about 3 pages, sometimes killing characters, sometimes not, but never giving me a pause to register what’s happening or feel any sort of emotional release. The resolution occurs and time shifts immediately back to present day.